Calls for resignation of Bulgaria's Socialist-endorsed Cabinet of Prime Minister, Plamen Oresharski, are now being heard on musical stages across the globe. The support of rock stars comes on the heels of the action #ДАНСwithme global in which Bulgarians in 27 cities in 11 countries joined the protests and after three ambassadors in Sofia and EU Commissioner Viviane Reding openly supported the rallies which have lasted for 43 days and counting. It was reported Saturday that the vocal of the French band Mass Hysteria has shouted the word "resignation" in Bulgarian four times at a concert during the Paleo Festival in Nyon, Switzerland, on July 24. A video of their concert in Nyon, courtesy of Euro Chicago, can be seen HERE. 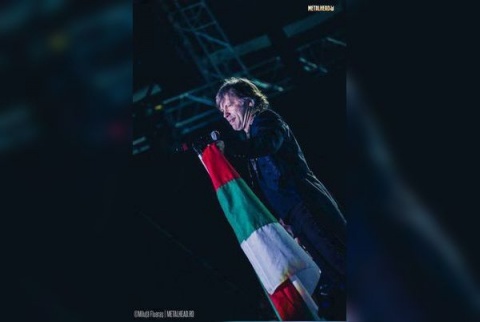 Meanwhile, photos of Iron Maiden frontman Bruce Dickinson, holding the Bulgarian national flag, are circulating on Facebook. Eyewitnesses say this happened on July 25 during a concert of the heavy metal legends in Bucharest. Dickinson is seen holding the flag upside down which is interpreted as war or lack of statesmanship. Bulgaria media also report that during the concert of legendary German heavy metal band Rammstein in Sofia Friday evening, the majority of the 20 000-strong audience has shouted "resignation" during the breaks.